Of all the swinging troubadours in Miami, Cleaveland Jones is undoubtedly one of the swingingest. Aurally, he's a mad dash of island cool amid a core of neo-classic Tropicalia. Live, he's just plain fun. With rhythms enough to make your heart skip a beat and melodies that simply compel you to sing along. These nights Jones is making his stand at The Standard, and the crowd has been assembling en masse. So Niteside decided to see what it's all about. On Wednesday night you'll again be taking the stage at The Standard. What's the story? I'll be back there on Wednesday, Aug., 11, and Wednesday, Aug. 18. It's a little confusing. Although I am there for the next two weeks, I'm usually there every other Wednesday. The name of the night is Standard Sounds. Doors open at 8 p.m. and live music runs from 9 p.m. till midnight. We usually play two, one-hour sets. The vibe of the music is Tropicalia. There is a lot of Brazilian influence and I sing plenty of Brazilian cover songs in Portuguese. I describe the tone is an upbeat mixture of samba, reggae and soul. I play with upright bass and Brazilian percussion, and, due to people's summer travel plans, we've a revolving cast of ace players. On my end, I have been incorporating a unique instrument into the mix -- the cavaquinho. It's a Brazilian version of a ukulele, and it's commonly used in samba, choro and other Brazilian folk music. It's also a crowd pleaser. How long have you been in residence there and how has the crowd been responding? We have been there on Wednesday nights since the end of May, and it has been going very, very well. The Standard is a really nice fit for me and the band, and we're hoping to keep it going through the season. Speaking of crowds, over the years you've built up quite a following in Miami. To what do you attribute your success? I just do what I do and hopefully the word gets out. Looking at the national music scene, it seems like there's an audience for just about anything. 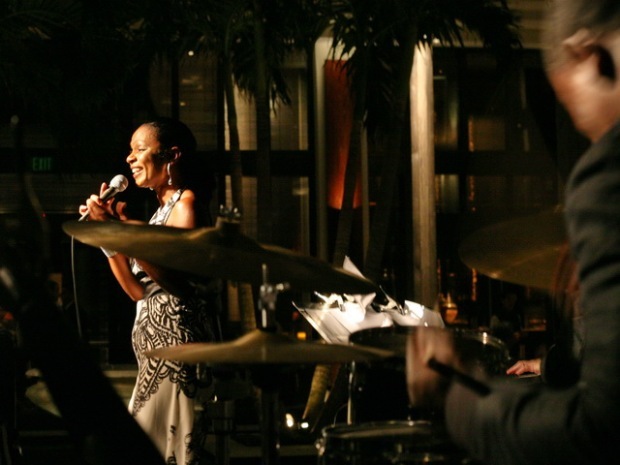 I have incorporated a lot of Brazilian influences into my music and the instrumentation of the group, and I think that world-wise angle helps in Miami. You're a native of Ohio. What made you come to Miami anyway? I moved here from Rio de Janeiro. I'd lived in Brazil for two years and the thought of moving all the way back home frankly scared me a little bit. I don't think they even have a plane that goes from Brazil to Ohio, so naturally I had to stop somewhere. I've lived here for about 12 years now. I never thought I'd have stayed this long, but I think it means I like it here. Did you decide on the name Cleaveland Jones just so you never forget your roots? I think never deny them would be more accurate, but it's not really that either. Cleaveland Jones just sounds like a cool name to me. I often introduce myself as Cleaveland and it almost always gets some kind of reaction. I think it rolls off the tongue really nicely. But the true story is that years ago I was hanging out with some friends at a musician's commune called the Monkey Village. ... One night I was brainstorming and running off a bunch of potential band names and Cleaveland Jones somehow popped into my head. I blurted it out and it was unanimous -- everyone immediately agreed that was the name. You've always been big on world-wise rhythms, be they from the islands or from Brazil. Is there something about that tropical beat which sends you? Perhaps. Maybe growing up in Ohio tropical and Latin music seemed more exotic. It was like something new back then. Music does have the power to send you to new places; I wanted to know more so I let it send me all the way to Brazil. World-wise rhythms also played a role in my decision to stay here in Miami as well. You recently released a set of remixes from your last record "Keeping Up with the Joneses." Who all is involved? Some of that stuff I did myself. I've also collaborated with Andres Ponce from Elastic Bong and Andrew Yeomanson, a.k.a. DJ Le Spam. Might we expect a follow-up LP sometime in the near future? Very soon. It's pretty much finished now but I am following some advice you gave me a while back: no need to release it in the middle of the summer. It should be complete sometime before the end of this year. I think the name is going to be "Taõ Jones." What do you think? I dig it! What other projects do you have on tap that we should look out for? I can't tell you everything, but it's huge. Okay. When you're not staging somewhere, where in town do you most dig hanging out? Believe it or not, i enjoy salsa dancing! Yucca on Friday nights and Tapas y Tintos on Tuesdays are regulars for me. I live on South Beach, and by many people's standards I'm probably one of those people who don't leave the area often enough. I also like the Design District though, especially on Second Saturdays for Artwalk. Garcia's on the River is my new favorite spot, but maybe you shouldn't print that so it stays cool. But really, I can't wait to get on the road again.